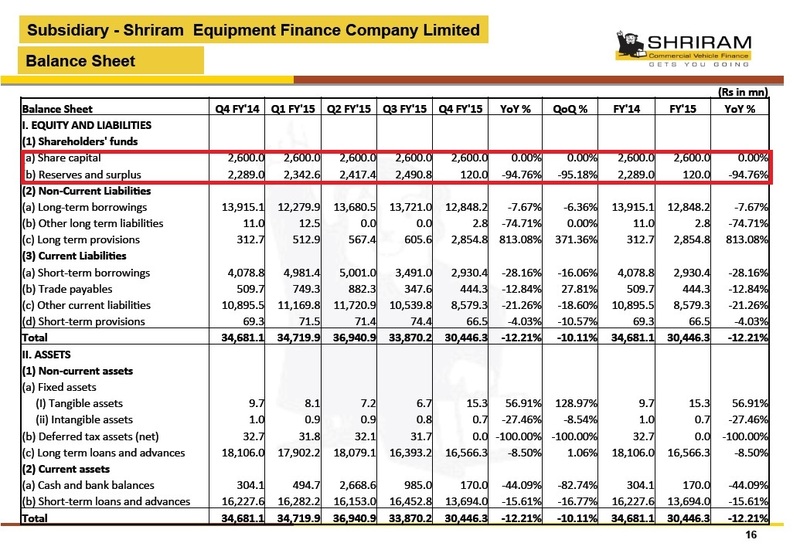 Shriram Transport Finance reported abysmal numbers in Q4 2015 with EPS down 74% compared to same quarter last year largely driven by the write off it had to take in one of its subsidiaries, Shriram Equipment Finance. Shriram Equipment Finance, established in 2009, lends to the construction industry for machinery equipments like cranes, forklifts, loaders etc. required to do the construction work. Over the years, the company had been reporting steady profits, book value growth and asset quality. Backed by the conservativeness of the accounting the management had followed in the past, the management pedigree and the high CAR ratios, there was little reason to worry before this quarter. The company provisioned around INR 2300 Million up above 900% from last quarter. It basically provisioned 95% of all the net worth that it had garnered still its establishment in 2009. With this provisioning, the coverage ratio is still at 60%. While the company is hopeful that the construction business will pick up and they will recover the debts, it also means some more pain might be in order if the construction activity does not pick up. This is a good lesson on how leverage can affect the results drastically both ways. While we have always emphasized that the finance business is only as good as the conservativeness of accounting and the pedigree of the management, it is an eye-opener on how quickly the game can change in the face of a bad quarter. While it is tough to absolve the management on why they did not see it coming, investors can breathe a little easy as Shriram Equipment Finance makes up a small portion of the total Shriram Transport Finance group. However, given the leverage, it managed to write off three quarters of the profit of the parent company. It is a hard reminder on how easy it is to lull oneself into believing that good returns are in order in the lending business.